Extra virgin: get this one. It’s the most expensive, but also has the highest polyphenol content and delivers that distinctive olive-oil taste. Virgin: a poor second, subject to harsher processing methods. Lower in polyphenols and not as tasty. Refined: extracted using chemical methods, not mechanical pressing. Skip it. Pure or “Light:” tasteless and boring. The only reason you’d buy this one is to make mayonnaise, if you want an oil without a pronounced olive-y taste. It’s also worth noting that the “light” refers to the color and flavor, not the calories – light olive oil has exactly as much fat and just as many calories as any other olive oil. It’s perfectly reasonable to get 1-2 tablespoons of olive oil in every day. Have a salad with a vinaigrette and you’re pretty much there! But 15 tablespoons is not so reasonable. So in order to make sure you really get the benefits of olive oil, you’ll want to get one with a high polyphenol content – and that means a fresh, high-quality, extra virgin oil. Because it’s such a luxury product, olive oil is the subject of an amazing amount of fraud. You can read all about this – and how to avoid it – in the article on avoiding food fraud here. The short version: if you can’t afford the good stuff, don’t get it at all; stick with coconut oil (less likely to be contaminated) and animal fat. It’s the eternal question: should you cook with olive oil? The concern here is that the monounsaturated fat in olive oil is less stable than the saturated fat found in, say, coconut oil (for more on this, go back to Part 1). Because it’s less stable, monounsaturated fat is more prone to oxidation, a kind of chemical damage that makes the fat rancid and inflammatory. Since one of the fastest ways to oxidize a fat is to heat it up, cooking seems like a definite “no” for olive oil. On the other hand, monounsaturated fat is still fairly stable – it’s not nearly as unstable as the polyunsaturated fat found in unhealthy cooking oils like canola or soybean oil. Another point in favor of olive oil is its natural antioxidant content, which provides a built-in defense mechanism against oxidation. That was the theory; now for the studies. In this study and this one, olive oil oxidized less easily than seed oils (sunflower and canola, respectively), but some damage was still apparent (and anyway, “better than canola oil” is not a terribly high bar to set!). Then again, these were very high temperatures and very long cooking times; few home cooks are going to subject their oil to an industrial fryer for 7+ hours! Given the relative lack of studies with more real-world scenarios, it’s hard to say what the effect will be of sautéing vegetables or browning meat in olive oil. Hysterical warnings that the oil becomes “toxic” after cooking are almost certainly overblown – but on the other hand, there’s not much reason to use it as a cooking oil in the first place, considering the other options available. Store your oil in an opaque jar. Never buy an olive oil that comes in a clear jar; that’s a sure sign of a low-quality (and probably fraudulent) product. Go for the ones in darker jars, to protect them from light. This is significant: in this study, for example, olive oil stored under simulated “domestic storage conditions” (clear, half-empty bottles) lost 20% of its Vitamin E content after 2 months, and 92% after a year. Store the oil in a cool place. If you buy it in bulk, that’s fine (it’s a great money-saver), but store the big container somewhere cool and dark, and siphon a cup or two at a time out into a smaller container to keep handy where you cook. Regardless of whether or not you choose to cook with olive oil, treating it properly will help protect its antioxidant content and other nutritional benefits. When you take a look at all the evidence, olive oil might not deserve all the breathless praise that advocates of the “Mediterranean diet” shower on its head, but it’s clearly a healthy food that’s perfectly fine to eat. It has a superior fatty acid profile and some potential antioxidant benefits, and the fact that cavemen didn’t have olive presses just isn’t a valid point against it. Heating it might be detrimental to the quality of the fat, but the industrial deep-frying used in most studies doesn’t tell us much about the effects of an ordinary oven. And even if there is still damage, it’s a huge step ahead from cooking with Omega-6-rich seed oils like canola or soybean oil. 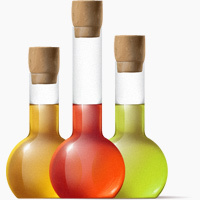 If and only if you can get high-quality olive oil, (check out the article on food fraud for tips on how to do this) it’s safe, healthy, and delicious. If you can’t get high-quality olive oil, stick with coconut oil, animal fats, or other Paleo plant fats. These fats are still healthy, and much more likely to actually be what you’re paying for.